New character, new technology, new name: with the ŠKODA Scala, the Czech brand is extending its offering in the popular compact car segment. The all-new model offers a high level of active and passive safety, full-LED headlights and tail lights, plenty of space for luggage and passengers, as well as numerous Simply Clever features. Five engine variants are available ranging from 90 PS to 150 PS. 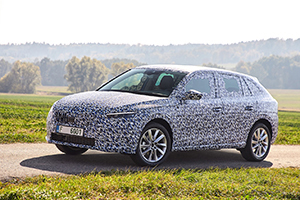 The five-door hatchback combines its emotive design with a high degree of functionality and state-of-the-art connectivity. The new ŠKODA Scala transmits the emotive design language of the VISION RS study, which impressed at the Paris Motor Show, into a series-production vehicle. It will enter the market as early as in the first half of 2019. With the Scala, ŠKODA is presenting the new emotive exterior and interior design language for the first time in a production model. It already attracted attention at the Paris Motor Show with the VISION RS. With the new model, the long-established Czech brand has also taken a big step in terms of technology. The name Scala, which comes from the Latin meaning ‘stairs’, fits perfectly. With the Scala, the ŠKODA brand has climbed several steps on the development ladder. It perfectly embodies a set of brand values which can be summarised very well under the term ‘smart understatement’. New sculptural shapes, dynamic elements and precise features lend the vehicle an emotive and authentic appearance with a strong identity of its own. As the first ŠKODA model, the new ŠKODA Scala is characterized by the next development stage of the ŠKODA design language, which will be also present in all future ŠKODA models. The new Scala is also the first ŠKODA production model in Europe to bear ‘ŠKODA’ in block lettering on the tailgate instead of the ŠKODA logo. Despite its compact dimensions, the ŠKODA Scala offers a generous amount of space in the interior for a vehicle in the compact car segment. The new compact model measures 4,362 mm in length, is 1,793 mm wide, and 1,471 mm high. The long wheelbase of 2,649 mm gives the ŠKODA Scala very good driving characteristics. In terms of interior dimensions, the ŠKODA Scala leaves nothing to be desired and is getting closer to the ŠKODA Octavia. The kneeroom is 73 mm (73 mm for the ŠKODA Octavia), elbow room in the rear is 1,425 mm (1,449 mm for the ŠKODA Octavia) and head room in the rear is 982 mm (980 mm for the ŠKODA Octavia). And in typical ŠKODA style, the ŠKODA Scala has one of the largest boots in its segment with a capacity of 467 litres. With the rear seats folded down, the volume increases to 1,410 litres. Other characteristics include the innovative optional full-LED headlights and tail lights. The new compact car is the first ŠKODA model to come with the rear dynamic indicator. Hidden beneath the rear bumper is an optional Simply Clever feature: an electrically retractable tow bar, which can be folded out using a button in the boot. Other features offered by the ŠKODA Scala include the ŠKODA‑typical umbrella compartment (incl. umbrella) in the driver’s door and the ice scraper in the fuel filler flap, as well as the optional electric tailgate incl. tip-to-close function. To complement the ŠKODA Scala’s modern look, the latest digital technology is also integrated into the car. The optional Virtual Cockpit can be configured in a variety of ways and is available with a 10.25-inch display, the largest in the compact car segment. The infotainment system displays measure up to 9.2 inches – also top in the segment. Thanks to a new generation of ŠKODA Connect mobile online services, passengers will have the option of locking and unlocking the car using their mobile phone and updating the software of the infotainment or maps ‘over the air’ – without the need to visit a dealership. All delivered ŠKODA Scala cars are the first ŠKODAs to be always online thanks to a built-in eSIM: this provides a high‑speed LTE internet connection with no need for an additional SIM card or tethered connection via a smartphone. As standard, this eSIM will support the functionality of Emergency Call and Proactive Service. The ŠKODA Scala comes with a choice of five different engines, all of which comply with the Euro 6d-TEMP emissions standard. They include three petrol engines and one diesel. All of the engines come with direct injection and a turbocharger as well as Stop/Start technology and brake energy recovery. The 95 PS 1.0 TSI transmits its power via a manual 5-speed gearbox. The 115 PS 1.0 TSI is available with a manual 6-speed gearbox as standard or with an automatic 7-speed DSG as an option. The ŠKODA Scala’s top-of-the-range petrol engine is the 1.5 TSI. This four-cylinder engine generates 150 PS and comes with a manual 6-speed gearbox as standard; a 7‑speed DSG is also available as an option. All petrol engines are equipped with a particulate filter. The four-cylinder 1.6 TDI with a power output of 115 PS produces 250 Nm of torque on the crankshaft; an SCR catalytic converter with AdBlue injection as well as a diesel particulate filter come as standard. It also complies with the Euro 6d-TEMP emissions standard. The efficient diesel engine is coupled with a 6-speed manual gearbox as standard, and a 7‑speed DSG is available as an option. One of the enhanced assistance systems available in the ŠKODA Scala is Side Assist. This optional system indicates to the driver when a vehicle is approaching from behind to overtake or is in the driver’s blind spot. While the familiar Blind Spot Detect has a range of up to 20 m, Side Assist can detect vehicles up to 70 m away and can therefore also effectively warn the driver of hazardous situations on motorways and dual carriageways. Rear Traffic Alert is an integral part of the Side Assist function. The optional Adaptive Cruise Control (ACC) is equally designed for use during long motorway journeys and works at speeds up to 130 mph. Lane Assist and Front Assist form part of the standard equipment. Front Assist including City Emergency Brake uses radar to monitor the area in front of the car while driving in the city and thus helps to prevent accidents. The optional Park Assist conveniently lends the driver a hand when parking – it automatically manoeuvres the ŠKODA Scala into and out of parallel and bay parking spaces. For safer driving and better visibility in darkness and bad weather, the ŠKODA Scala will offer full‑LED headlights and tail lights. In the interior, LED ambient lighting creates a pleasant atmosphere. tensioners for the occupants of the front seats have been deployed; it can, however, also be operated manually at any time. You may not like it but it is what happens on my side of the counter, old Q7's are a nightmare, most bought by people who want an image they can't afford. Yep me, hence my comments! Updating the ECU was the easy bit to be honest, just you need to be aware that you need to do it. I don't know why there isn't an Ash Mass figure. I've only very recently got my VDCS so I just plugged it in and ran a scan. Is this the sign of the DMF (dual mass flywheel) is failing where the clutch judders at its worse when engine is at its operating temp. Re: Do these VCDS traces explain my limp mode? Thanks Crasher, something like the new attachment? The difference between none and implausible is huge in this case. Re: Probable Transmission ECU failure, causing stuck in Park until car warms up enough. How did you resolve it cheaper ? Re: Clunk from front coming off a bump.